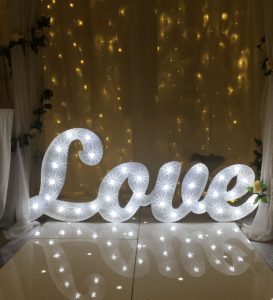 Whatever you call them LED letters, Light up letters or ‘those giant letters you see at weddings’ one thing is for sure; they make quite a statement. We have an extensive range of LED letters for hire whether its for a wedding, prom, graduation or birthday we have letters and numbers to suit. All our LED letters are 4 foot. We deliver to anywhere in Glasgow for free and a small surcharge may apply to venues outwith Glasgow. 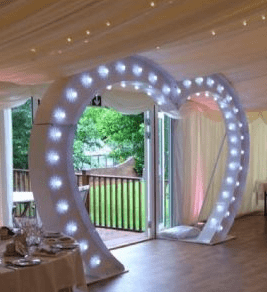 New In… We have a stunning ‘light up love arch’ for hire which has a variety of uses such as at your venue entrance, at the end of your aisle or even as a feature so your guests can get their pictures taken under it. See below for details. Get in touch to see if our LED letters, numbers or love arch are available for your event. Our stunning new in light up love arch is now available for hire. Our LED love heart arch is 2.4 meters high and has amazing fairground bulbs. The 60 bulbs are cool and safe to touch. This fantastic love heart arch will really wow your guests and will have your guests taking pictures under it all throughout your event. This is one of our more popular items so get in touch to see if your date is still available. You can reserve your date by paying a 20% deposit at the time of booking.